London - International bestselling author Sir Terry Pratchett today launched NARRATIVIA, a new multimedia production company with exclusive worldwide rights to all of the writer's work across Film, Television, Merchandising and Digital Media. NARRATIVIA will bring the management and development of the Pratchett brand under one roof and the executive team, headed by Managing Director Rod Brown, will be based in Soho London. 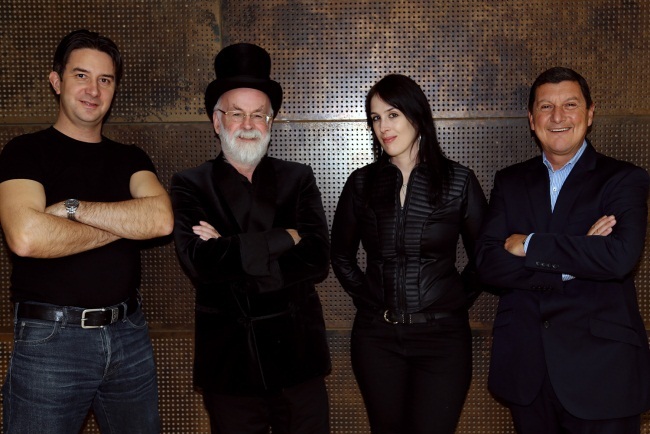 Brown will work closely with the author, and NARRATIVIA directors, Pratchett's business manager Rob Wilkins and author's daughter and fellow writer, Rhianna Pratchett, on a day to day basis, to drive the company forward. NARRATIVIA is already working on a number of Pratchett related Television and Film projects with high profile production partners and script writers, details of which will be announced in due course. NARRATIVIA will ensure that projects stay true to the author's intelligent and empathetic vision, while diversifying into the formats that will introduce the work, both old and new, to new territories and audiences. Sir Terry Pratchett said, This is an exciting and natural development for me and my works, and I look forward to working closely with the team to develop new stories in areas other than just print and ebooks and, of course, seeing my first Big Screen project come to fruition. Rod Brown said, This is a dream challenge for me! Having worked very happily with Terry, Rob and Rhianna over the past decade on the three mini series for Sky 1, I have grown to love the world and characters Terry has created so when Terry invited me to head up the company for him, it was easy to say yes... please! More information will soon be available from Narrativia's website or Narrativia's Facebook Page.